This winter I introduced a standardized warm-up to my indoor training rides and eventually, as the plan goes, to my outdoor races as well. 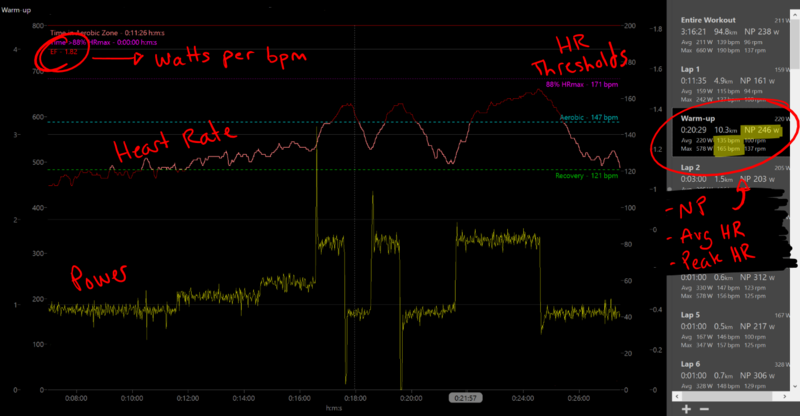 It’s a quick 20-minute ramping effort with 1-minute high-cadence (>120 rpm) intervals and a 3-min @ Threshold interval. I use my warm-up to gauge how fresh or fatigued I am, using HR in real-time and asking myself how my legs, my lungs and my head feel. I also use the standard warm-up to track how my fitness is changing over time via Efficiency Factor (EF). Warming up is essential to prepare your body and mind to perform at its very best. Not doing so will normally compromise your performance. Having a planned warm-up routine will help you prepare mentally for your race or training session. A very important aim of the warm-up is to “switch” your aerobic energy system on prior to you starting your main effort. If you will be doing sprint efforts or preparing for very high-intensity race, neuromuscular activation is also very important. I like to think of my warm-up as the Pavlovian bell that tells my body & brain it’s game-time. The warm-up is a repeatable pattern that my body and brain recognize, I know what to expect over the next 20-minutes, and I can prime myself for the effort. It’s a ritual of sorts; after a few minutes of faffing about on the trainer getting ready for the ride, maybe finishing the last sips of coffee and setting up some entertainment for the day. 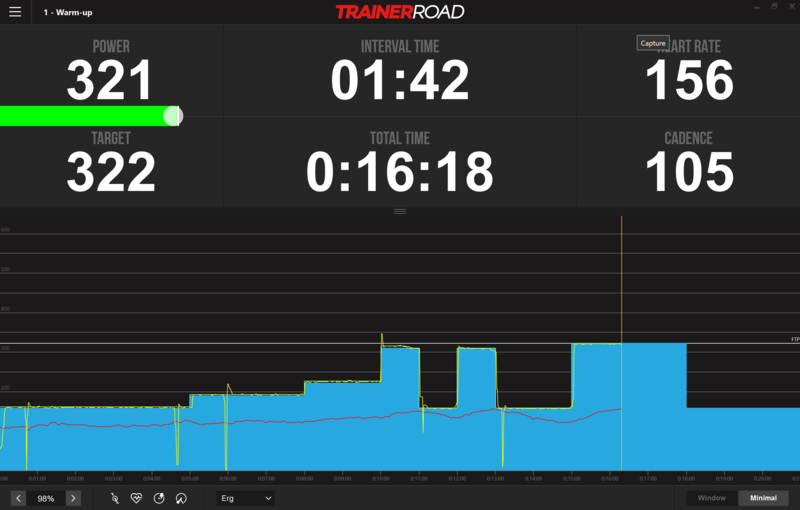 I click over to TrainerRoad, load the Warm-up and settle in for the workout. As the effort ramps up my focus increases. 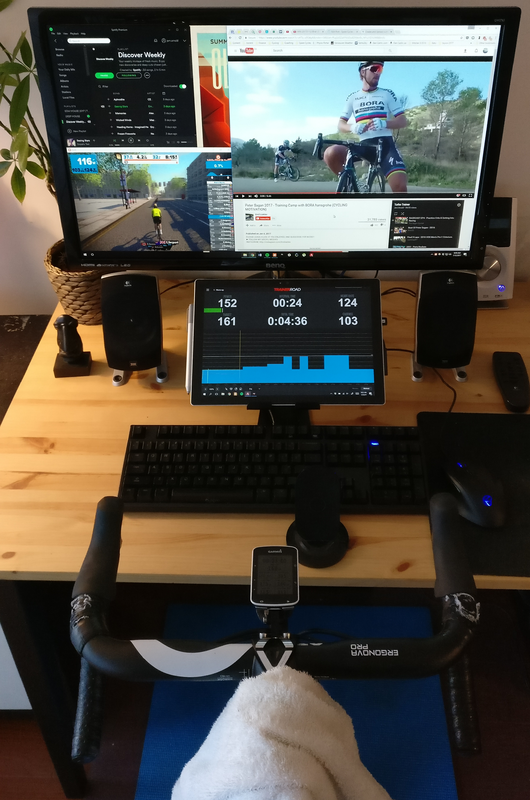 Even if I’m not looking directly at the TrainerRoad display I have a sense of the timing and know when the first efforts are about to begin. By the time the 3-minute @ Threshold interval begins I’m locked in. It’s hard enough to deserve full attention and respect, but short enough that my mind and my form don’t wander under the effort. I focus on breathing and spinning the legs smoothly. Upper body relaxed. I’ll check my Heart Rate to get an objective measure of how my body is responding, and if it matches my subjective sense of freshness or fatigue. As I go through the warm-up I watch my Heart Rate in real-time. Through experience, I know roughly where my HR should be for each interval of the warm-up. For instance, I want to see HR between 145-150 bpm for the high-cadence intervals, and 150-165 bpm during the 3-min @ Threshold. The numbers can tell me if I’m fit and fresh; HR should stay under control for the efforts and recover quickly between. Or if I’m fatigued; HR might jack up and not recover as quickly; or the opposite – remain depressed through the work intervals. And give them a subjective rating for how I’m feeling. Nothing too precise, just a mental note that “legs feel heavy” or “3 hrs on the turbo?! I’m bored already…” Where this usually appears is in my post-ride comments in TrainingPeaks. I usually find that how I’m feeling during this 20-minute warm-up will define how I feel for the remainder of the workout. I have a custom chart in WKO4 that gives me a sense of cardiac efficiency – what is my physiological cost for producing power? Or, how many watts-per-bpm can I generate? This first chart shows a typical Warm-up. HR rises smoothly during the ramp-up, responds quickly to the work intervals, and recovers well in between. Avg and Peak HR (highlighted at right) are right around where I’d expect to see them. 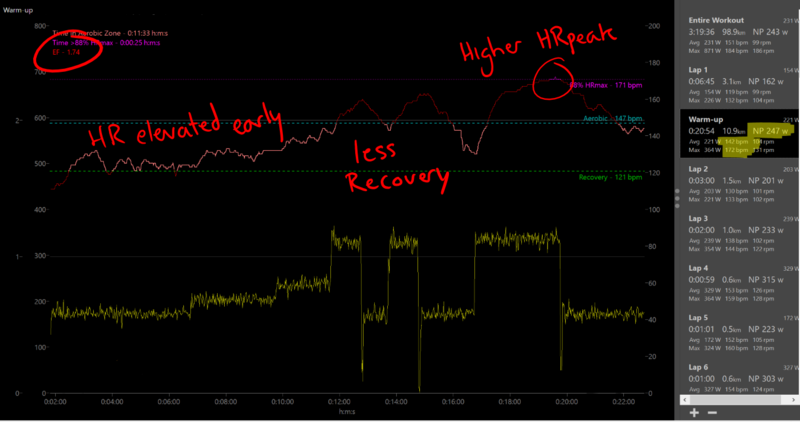 The highlighted HR line shows when it sits within my Aerobic zone 2 (121-147 bpm). This tells me how well my Aerobic system is switching on. Note the Efficiency Factor (EF; top left) is nice and high. This will be highly variable in between individuals, according to your FTP and HR characteristics. But look for a consistent trend in your own EF over time. Chart 2 shows when I was particularly fit and rested. Note first the higher EF, indicating higher cardiac efficiency. Still a smooth ramp up in HR, but it’s lower on average for the given power output and doesn’t peak as high as in the first chart. Importantly, HR still recovers well during the rest intervals; I look for rate of incline/decline and where the max and min values appear. If HR wasn’t recovering well during the rest intervals, this low HR trend could mean I’m fatigued and might have trouble raising my heart rate for a high intensity effort. Chart 3 shows a day at higher fatigue. EF has tanked. Notice the elevated starting HR; it popped right up out of my Recovery zone 1 and into Aerobic zone 2 at the very start of the ramp-up. HR peaked higher for each work interval, and didn’t recover as quickly or as deep during the rest intervals. I’m sure I noticed this elevated HR in real-time during the warm-up, and very likely could already feel something wasn’t right with my legs, lungs and/or head. The final chart shows my overall EF (Efficiency Factor; red) for each ride, tracked against the TSS (training load; blue) of that ride. I can visualize the trend of my Cardiac Efficiency as it improves over time. For the long-term trend, I would expect to see HR fairly constant, while Power continues to improve. 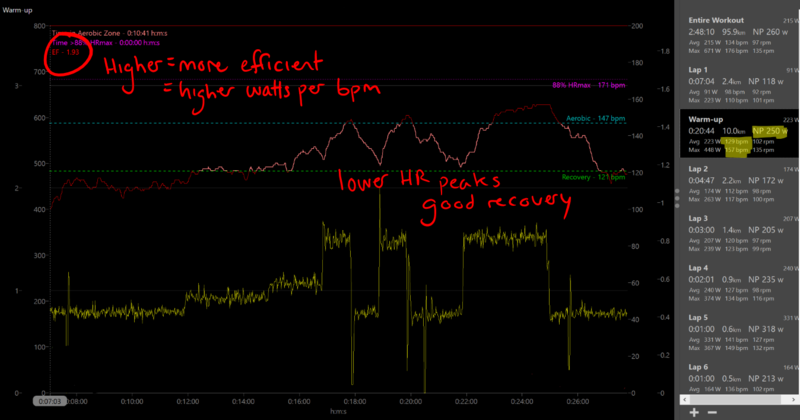 More watts for fewer bpm means it costs me relatively less physiologically to generate power. I’d call this the definition of increasing fitness! As a way to prime your body and mind for the upcoming efforts. To open up your legs, lungs & head. To get an objective measure of your restedness in real-time, to modify your workout or race goals as appropriate. And after the fact as a simple benchmark to measure longitudinal changes in cardiac efficiency and overall fitness. Hola buenas noches.. Donde puedo conseguir los charts de capturas de pantalla,para wko4? ?